Includes: bra, skirt, arm bands, wrist cuffs, necklace, half-circle chiffon veil. 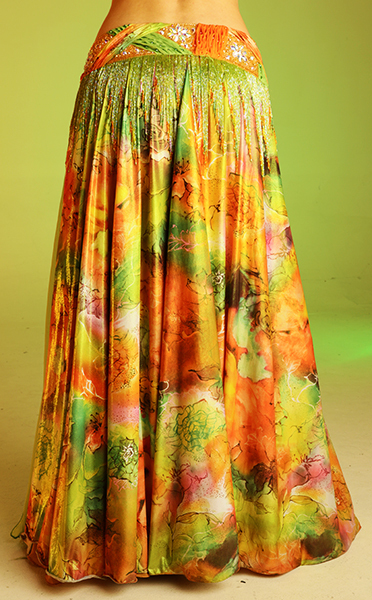 Fabric: gren/orangepink abstract flower print metallic lycra, orange and green chiffon. Beading: green, orange, AB stones. Belkt & Skirt: one piece belt attached to the skirt. 38" from end to end. Full skirt with upper layer lycra and bottom layer chiffon with one slit. Length: 40".